On the freemasons website that Wayne Herschel is referring to on the Key of Solomon website, the freemasons speak of the wisdom of the ancient Philosophers who regarded the soul of man to have its origins in Heaven. The soul was believed to incarnate into the flesh after having descended from Heaven passing through the Gate of Man. Having lived another live on Earth the soul eventually left the body after death and returned to Heaven again this time passing through the Gate of God. The Gate of Man corresponds with the crossing of the Milky Way and ecliptic at 5° Gemini (sidereal zodiac) while the Gate of God corresponds with the crossing of the Milky Way and ecliptic in 5° Sagittarius. The Greek writer Macrobius called these gates on the ecliptic, through which the souls ascended and descended to Heaven, the Gates of the Sun. This is because not only mortal man but also the Sun dies and is reborn in the precession cycle at the very same gates. When the Sun resides on the gates of the Sun at an equinox or solstice, it represents a Galactic Alignment and Great Celestial Conjunction. 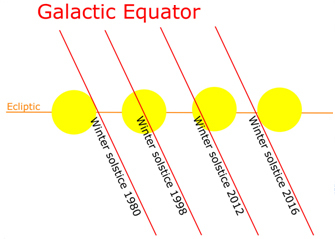 What happens during the 39 year period of a Great Celestial Conjunction is that the Sun at the equinox or solstice slowly shifts through the Galactic Equator of the Milky Way. On Earth, the River Nile was the reflection of this great river in the sky, in accordance with the Hermetic principle "as above, so below." Herschel's earliest ingenious research has demonstrated that all of the pyramids along the river Nile represent constellations along the Milky Way, not just Orion! There are more than 50 pyramids in total, and their true meaning can only be deciphered when one considers the whole of Egypt. 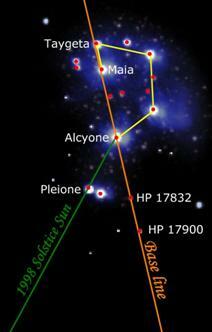 During a Great Celestial Conjunction, the Sun crosses that great river in the sky, the Milky Way. Egyptologists explain that the solar God Ra (and Horus) required a boat because they sailed the Heavens from sunrise in the East to sunset in the West. At night, Ra travelled the Netherworld to be reborn in the morning at sunrise. Egyptologists reject the idea that the Egyptians understood the Precession of the Equinoxes and that the Sun also sojourns along the zodiac in a 26,000 year journey corresponding with the Precession Cycle. In the Book of the Gates, the travel of the Sun at night along with the deceased pharaoh into the Netherworld is described. The Sun enters the Netherworld in the first hour just after sunset to be reborn in the morning at sunrise after a twelve hour nocturnal journey. There are many parallels, however, with the precessional journey of the Sun along the twelve signs of the zodiac to be discovered in the Book of the Gates. The 12 hours in the Book of Gates are structured into four groups of three hours, denoting a cross in the face of the clock. In the 12th hour Nun raises the solar barque with the scarab beetle of the Sun God from the primeval waters (Milky Way? ), this is the hour of the rebirth of the Sun. Left: Nun raises the solar barque from the primeval waters at ‘sunrise’, the time of the rebirth of the Sun. During Ra's travel through all of the twelve signs of the zodiac in the precession cycle, he will be requiring a boat to twice cross that great river in the sky, the Milky Way! It is probably the only reason why the Egyptian deities required a Sun barque in the first place. Boats are used to cross waters, not skies, so it was used not for their nightly ecliptic travel from East to West through the Netherworld, but for their travels along the zodiac in the precession cycle. It is during this journey that the Sun would be required to cross the waters of the Milky Way at least twice. The Book of the Gates may therefore have been misinterpreted by Egyptologists as the nocturnal journey of the Sun simply because they reject the idea that the Egyptians understood Precession! Keep in mind that only twice per year on the equinox the day and night will be exactly 12 hours in length. It is therefore far more logical that the 12 hours in the Book of the Gates are in fact the 12 zodiacal Ages of the Precession Cycle. Pharaohs in ancient Egypt were buried with their arms crossed holding Ankhs in their hands. 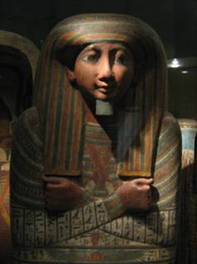 This posture of the deceased pharaoh can be found on sarcophagus and in statues throughout Egypt. The Ankh represents a cross symbol. Left: Grave statue of Tjel mayor of Memphis under Amenhotep III Dutch national museum of antiquities, Leiden. Right: Sarcophagus with crossed arms and X cross on chest, Dutch National Museum of antiquities, Leiden. Since the Greek inherited much of their wisdom from the Egyptians, it's more than reasonable to suspect that the gate or portal mentioned in the Book of the Gates through which the pharaoh enters the Netherworld is, in fact, the Gate of God that the Greek writer Macrobius writes about. The Gate of God was also called the Golden Gate, while the Gate of Men was called the Silver Gate. 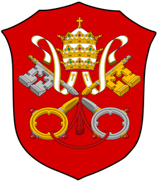 The very same Egyptian cross symbolism used by the pharaohs associated with the Golden and Silver gates of the soul (and the Sun) can still be recognized in the coat of arms of the Vatican, consisting of two crossed keys; one Golden, one Silver. The Golden Gate is the ecliptic Milky Way crossing at the Scorpio-Sagittarius nexus on the zodiac while the Silver Gate is the Milky Way ecliptic crossing at the Gemini-Taurus nexus. The Silver Gate was represented by the horns of Isis and the associated bull Taurus. 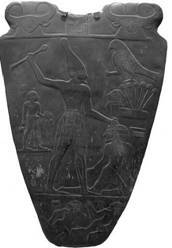 The Silver Gate is also clearly depicted in the Narmer Palette (3100 BC) named after the Egyptian pharaoh. 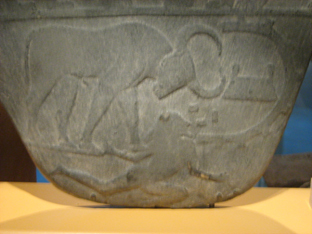 The Narmer Palette shows the celestial goddess bull Bat (Taurus) with her horns bent over pointing exactly to the place of the rebirth of the Sun, the Silver Gate. The two cow's heads on top of the palette also represent Bat. In-between the two cow goddesses a hieroglyph is depicted representing the rising of the Sun in between two mountains on the horizon. It's a hieroglyph that is very similar to the Akhet hieroglyph with the same significance. Bat on the left and right with the 'Akhet' glyph in between. Bat was the goddess of the Milky Way considered to be a pool of Bat's cow milk. Bat was also the goddess of the human soul, the "Ba" that incarnated into human life form. Since the soul incarnated into human life passing through the Silver Gate (crossing of Milky Way and ecliptic), it's not surprising that Bat was both the goddess of the Milky Way and the human soul. Ba is a derivative of Bat, whereas "Ka" represents the human light-body. "Mer" represents the light of the Egyptian light-body-soul complex, the "Mer-Ka-Ba." Bat was also called the "Ba of Two Faces." Egyptologists are in the dark about her name and don't seem to understand that she was called this way, because there are actually two portals both to and from the Netherworld for the Ba to descend into the physical plane (Silver Gate) and ascend from the physical plane (Golden Gate). Both Hathor, Isis and Bat are all cow goddesses and Egyptologists have often pointed out the similarities between these goddesses depicted with cow-horns suspecting that they may have the same origins...they all represent the Silver Gate. 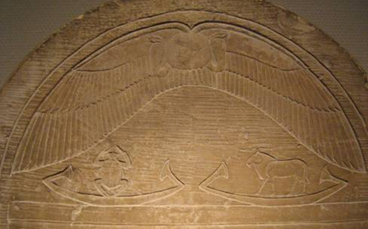 At the bottom of the Narmar palette in-between the horns of the bull, the very same hieroglyph is depicted as the one shown between two Bat bulls on top of the palette. This Akhet-like hieroglyph symbolises the rising Sun on the horizon. The Narmar Palette, bull in close up on the right. The bull is leaning towards the Silver Gate near the Gemini-Taurus nexus depicted in between the horns. The hieroglyph in between the horns resembles an Akhet glyph and represents the Silver Gate. 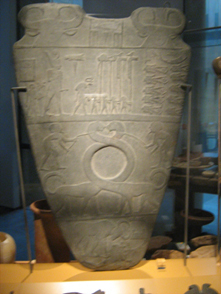 On the other side of the Narmer palette two identical men, hence suggesting twins are depicted. They are both looking over their shoulders to a particular square over the left man’s shoulder. We surmise that the twins represent Gemini which would make sense since the actual ecliptic Milky Way crossing of the Silver Gate occurs in 5° Gemini (sidereal zodiac) and the square could therefore be suggesting the Silver Gate. The author Audrey of the website "Ancient Egypt" writes while referring to the Narmar Palette: "They present an overview of the astronomical event which occurred on September 21st in 4468BCE, when the Autumn (Fall) Equinox of the Sun was in conjunction with the Milky Way." At the Autumnal Equinox, the Sun was indeed at the Milky Way, however at the Golden Gate. At the Vernal Equinox of 4468 BC, the Sun resided at the Silver Gate. The author (Audrey) does not seem to realise that this moment represented a Great Celestial Conjunction when the equinox axis (Vernal and Fall) aligned with the Galactic Equator and the Sun resided at the Gates of the Gods. 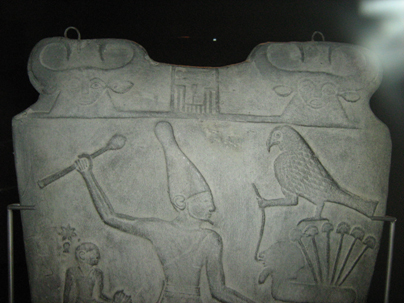 Instead, while interpreting the hieroglyphs of the 10 decapitated figures near the Solar Barque, he writes quote, "The full meaning of the hieroglyph can therefore be interpreted as 'the Sun at a sacred gateway, opening or portal'..."
While Hathor, Isis and Bat are all cow goddesses, Egyptologists have often pointed out the similarities between these goddesses depicted with cow-horns suspecting that they may have the same origins. . . .
We suggest that they all represent the Silver Gate. There is an even older Egyptian goddess that later was associated with Isis and Hathor. Her name is Serket and she was the deification of the scorpion goddess who healed stings and bites. Eventually, Serket was associated with Isis and she was said to be just an aspect of Isis. 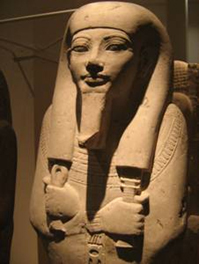 Serket and Isis can therefore be regarded as the ‘Ba of Two Faces’. While Isis represents the Silver Gate at the Gemini-Taurus nexus, Serket is her counterpart and she represents the Golden Gate at the Scorpio-Sagittarius nexus. This is why she’s wearing the scorpion on her head while she joined Ra in his barque on his journey around the zodiac in a Great Year. Right: Serket with the scorpion at her head representing the Golden Gate. 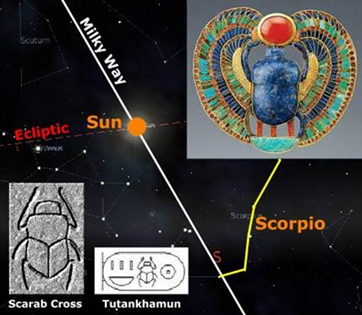 The sacred Egyptian scarab beetle is a metaphor for the Sun in the precession cycle whereas the dung ball represents the Sun. The scarab beetle rolls its dung ball with his hind legs backwards, symbolizing the backward motion of the Sun through the zodiac in the precession cycle. Since the scarab beetle has many similarities with a scorpion, we surmise that Serket and the scarab beetle both represent the Golden Gate in Egyptian mythology. near Sagittarius-Scorpio nexus. The dung ball of Scarab beetle is the Sun. On the left, the scarab beetle in a barque. On the right, the bull with the horns in a barque. They represent the places where Ra requires a barque to cross the Milky Way river in the precession cycle and thus represents the galactic equator. Dutch national museum of antiquities, Leiden. The most interesting of female ‘horned’ Egyptian goddesses in the Egyptian pantheon is Seshat. She was the goddess of astrology mathematics architecture and keeper of the measure of time. Seshat with the down turned horns and eight pointed cross. Although interpretations differ what the cross above Seshat represents, some believe it represents a seven pointed star on a pole, other believe it represents a papyrus leaf, the authors of this article suggest that it represents an eight pointed cross, symbol of the Great Celestial Conjunction. It is placed right below the down turned horns exactly at the place where the Sun will reside during a Great Celestial Conjunction at equinoxes or solstices. Seshat headdress was called Safekh-Aubi (Sefekh-Aubi) and meant ‘She who wears the two horns’. Seshat helped pharaoh with the alignment of the temples in Egypt in a ritual called Pedjeshes which translates into ‘Stretching the cord’ (Pedj--"to stretch," Shes--"a cord"). 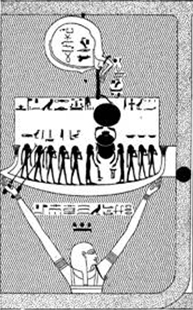 Armed with two pegs connected by a rope, pharaoh was accompanied by a priestess representing Seshat and aligned the temple to the celestial’s Bull’s leg while Seshat connected the other peg to her ‘home place’. 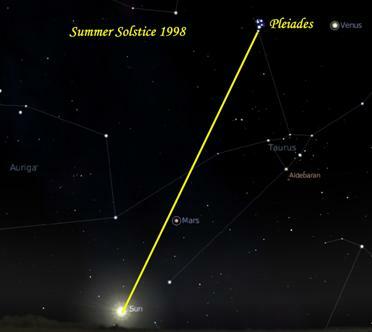 Since Seshat’s ‘home place’ is in between the horns of bull Taurus where the Sun resides at a Great Celestial conjunction and where also the eight pointed cross is depicted, the authors suggest that in the Pedjeshes alignment ritual the Pleiades as the ‘leg of the bull’ (Taurus) is being used to show the way to the place where the Sun would reside at a Great Celestial Conjunction. In this ritual the temple was aligned accordingly!